Fig. 1. Photo of Williamson Lionel Moise at age 16. Williamson Lionel Moise (1879-1964), son of Charles Henry Moise (1830-1896) and Theodora Sidney Moise (1837-1925). His father worked as a newspaper reporter and in the insurance industry, which left an impression on his son who aspired to be a writer. "The following sketch of Mr. Moise's life may be of interest to readers of the CHRONICLE. He was born at Sumter, S. C, June 10, 1879. He attended the graded schools at that place until he was sixteen years old. Deciding to stop school he went to Savannah, Ga., to work. He stayed in Savannah only one year when his health failing he was compelled to stop work and return home to recuperate. 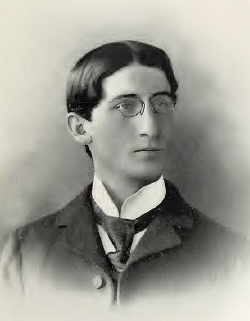 In the fall of 1896 he was sent to Clemson College where he soon became an important factor in literary work. He has been honored by his literary society on several occasions and has won two medals in public contest. He is now President of the Palmetto Literary Society and holds the position of Assistant Literary Editor on CHRONICLE staff. We predict a brilliant career in the literary world for Mr. Moise. He is a young man of recognized ability, who throws his whole being into whatever he undertakes and we venture to say that wherever his lot in life is cast he will make himself felt." Fig. 2. Coins, Stamps, Paper Money, and Curios dealer business envelope of W. Lionel Moise at the age of only 16 years old. 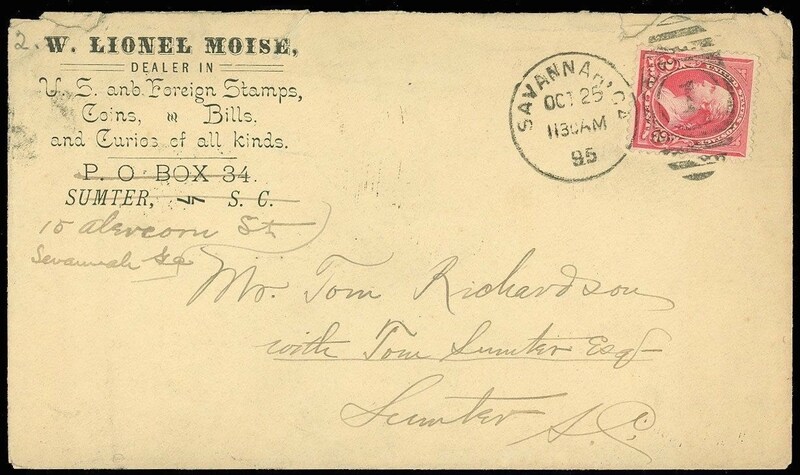 He had recently moved to Savannah, Georgia from Sumter, South Carolina and amended his mailing address by hand. Courtesy Lupia Numismatic Library. In 1900 he wrote the lyrics to a new popular song "Cupid's Victory" with musical composition by Mary Squires Williams, sold by H. G. Osteen & Co.
By 1906 he was a theatre critic at Texarkana for The Theatre Illustrated Magazine. On January 8, 1908 he married Edna Josephine Lewis at Cincinnati, Ohio. The couple soon divorced. On April 19, 1922 he married Carrie Eck (1890-1960) in New York City, New York. He died October 8, 1964 at Atlantic City, New Jersey. He is buried in the Jewish Cemetery, Sumter, South Carolina. The Moise family of South Carolina: an account of the life and descendants of Abraham and Sarah Moise who settled in Charleston, South Carolina, in the year 1791 A. D.